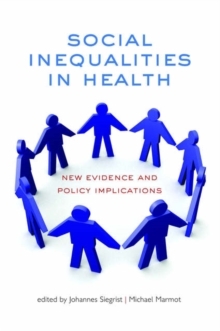 Health inequalities according to people's social standing are persisting, or even growing, in modern societies. Recent decades have revealed evidence of strong variations in life expectancy, both between countries and within them. This widening of social inequalities has developed despite considerable progress in medical science and an increase in health care spending. The reasons behind this are complex, and the implications considerable. This book provides a summary of the major achievements of a five-year European Science Foundation (ESF) Programme on 'Social Variations in Health Expectancy in Europe'. The contributors are major figures in their subjects, and combine state of the art reviews with the latest results from interdisciplinary research in epidemiology, sociology, psychology and biomedicine. Three conceptual frameworks of life course influences, health effects of stressful environments, and macro socialdeterminants of health, are unified, while each chapter addresses the policy implications and recommendations derived from currently available evidence. The major topics covered include the role of family in early life, social integration and health, work stress and job security, successful ways of facingadversity, and the impact of the larger environment on health. Epidemiologists, public health research and policy makers, and students of related public health and sociology courses wlll find the results of this research fascinating.